By contrast, Netflix is focusing heavily on building its library of original content and relying much less on licensing content from third parties. Its library size stood at just under 5000 as of February 2017. Moreover, Netflix is focusing on newer titles rather than older. Ampere Analysis says there has been a 1,102% increase in titles two years old or younger, and a 60% decrease in titles 5+ years old. It could be that cordless Amazon customers are using Prime Video as an aggregation point for many of their viewing needs, not just to watch shows and movies available for free to Prime members. Netflix is nonetheless valuable to them, but there just isn’t as much content they like to watch available through the service. 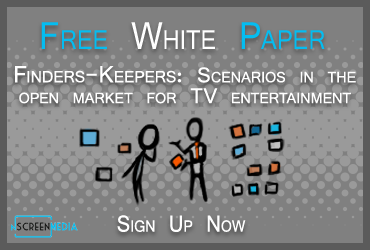 One-third of the people streaming to the television does not have traditional pay TV. 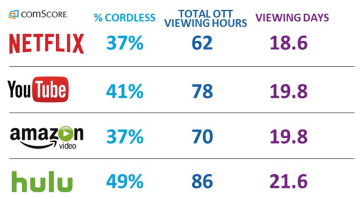 Of that group, those using Hulu stream the most content overall. Cordless Amazon Prime Video users stream 12% more video than Netflix, likely because they are using Amazon as an integration point for many of their SVOD services.